As you will probably notice, things look a little different around RobbSutton.com. As a matter of fact…I have gone against a lot of the advice I have given and the look at RobbSutton.com has changed a lot recently. Don’t worry…I still believe that not obsessing about design and just generating content is the only way a blog will survive. You can really get caught in a one pixel mentality that will make you into a web designer with yourself as the only client instead of a blogger. I really wanted to go with something different this time around. While the colors are simple, the header is thin and everything else seems to be pretty straight forward…I wanted to do something with this blog that I have dreamed of doing for awhile. Let’s be honest. How many times you do actually interact with the information in a 350px block roughly on the right. Rarely right? Maybe the first time you visit a site? It is already proven that ads convert the lowest there. I started looking at analytics and that was the least used portion on the site. In most cases, even the footer was used more often. The sad part….that is a third of your content space! I designed the new look of RobbSutton.com to have no sidebar. It is officially a full width, one column setup site wide. You will not see any narrow column to the right or left anywhere on this site anymore. Am I saying to go drop all of your sidebars? No. This might not be for everyone and it might not be for every subject matter. As an example, I will be keeping the sidebar over at Bike198.com for now. Ultimately, I would like to do the same over there but at this point in time it doesn’t make sense. For a pure content blog like here…it is perfect and I already feel like I have room to breathe. 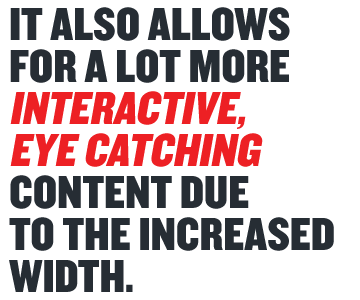 It also allows for a lot more interactive, eye catching content due to the increased width. Have you ever had one of those times where you wished you could wrap a wide picture or video within the content? How about embedded music or another bit of interactive content? With the increased content width (in this case 940px), there is a lot more flexibility to do what I want with my content. Why would all of these sites opt to drop a sidebar and go to single column? Responsive design has done incredible things for websites and designers. For the first time ever, you are able to keep your same look, feel and branding across multiple mediums. Now, when your readers go to your website, they are not hit with a difference experience than they would be on the web. They see the same design…it is just tweaked a little to fit their screen automatically. What does this mean for your content website? The content is then centered and the sidebar is dropped below the content so you are not reading extremely small text. So what are you really doing? Reading a single column website on your mobile phone or tablet when the main site might have sidebars (which you might be already doing for this article). Mobile web traffic is on the rise. It will be the majority of web traffic in the very near future which will make sidebar content even less visible. All I did here, was give you that same experience on the web as well so now my branding and feel really doesn’t change across any medium. When you go from your phone…to a tablet…to a computer…you are hit with the exact same experience. What was the cost? Really nothing. I can still run advertising in the highest converting spaces. I still have a footer for some content and navigation hasn’t changed. The only thing I lost was the lowest converting section of my website. Damn. I’ll be staying up late at night losing sleep over that one. As a general rule, I am pretty bad about launching things early for myself (another thing I tell clients not to do), so there are still a couple more things I will be adding like a search bar and newsletter signup form at the bottom of posts. I also have a dedicated homepage in the works that will be rolled out sometime in the near future. So what do you think? Is this the future of the web as we know it? Does your sidebar convert or are you ready to drop it as well? Let me know! I am currently re-designing and moving my blog to a new host and have been looking at how I am going to design it. I originally wanted to keep the sidebar and was pretty adamant about it…but what you are saying really makes sense here and I can still have navigation but through the menu bar…cleaner and less confusing for everyone I think. Plus as you say the content is front and center and that’s what really matters.